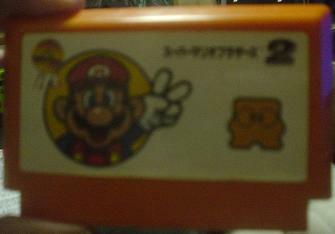 One of the more sought after pirate cartridges is Super Mario Bros. 2, also known to gamers as Super Mario Bros. 2j or SMB2j. This game was never released outside of Japan. It's essentially a level hack of the original Super Mario Bros., including new and tougher levels, a Luigi game option, and some new music during the rescue of Princess. What makes the SMB2j pirate cartridge special is that SMB2j was never officially released in cartridge format. It was instead released on disk for use with the Disk System. Leave it up to those pirate makers to figure out a way to bring the joy of the Disk System version to cartridges. There are many different SMB2j pirate cartridges available. It's impossible to know how many label and cartridge variations. Most just have the regular game on it. Some are known to have a level select option on the start screen, which can help gamers get through what is a very tough game. Expect to pay anywhere from $7 to $25 for multi-carts. 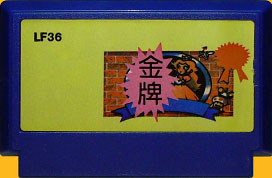 A SMB2j cartridge would probably go for closer to $30 on eBay, possibly more, depending on what extra features it has. 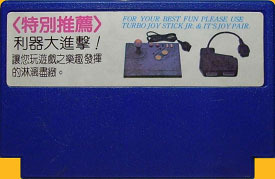 Back label has an ad for Turbo Joystick Jr. and Joy Pair.